Experience the Beauty of the Mississippi River aboard the Mississippi Queen! 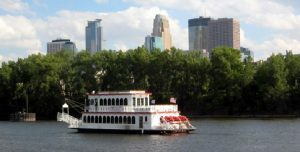 The narrated cruise will take you along the southern trails of the Grand Rounds Scenic Byway and Heritage Trail, along the U of M riverfront, under the stunning 35W Bridge, with views of St. Anthony Falls, the Stone Arch Bridge, the river bluffs and the Minneapolis skyline. Then we will enjoy fettuccini alfredo, spaghetti marinara or baked lasagna at The Old Spaghetti Factory. Bus leaves Bethel Lutheran – 4120 17th Ave. S. at 11:00 AM. Return at approximately 3:30 PM.